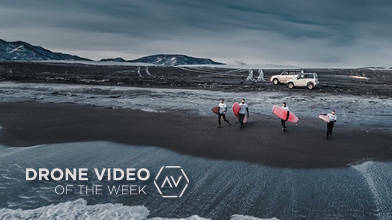 Description: From the land of April snow, we bring you the Drone Video of the Week Ep 7 nominees! Make sure to check out the full cuts in the links below and then VOTE for your favorite! Tuscany (Italy) by Drone in 4K Cinematic was shot on the Mavic 2 Zoom by iOlti Films. It's full of city views, cypress trees and of course, wine! You will enjoy this relaxing and beautiful aerial flight. Welcome to AirVuz RobSkyHigh! Utah in Motion is his first upload and he describes it as "the spectacular beauty of Utah put in motion." When you watch this, you will fall in love with the captivating gorgeous views of Utah. RJurevics shows off creative editing and beautiful views of New Zealand landscape in his video New Zealand's north island. Looks like paradise to us! Kamchatka. The Winter Surf Challenge was shot with the DJI Inspire 2 drone with the Zenmuse X7 camera. Timelab.pro says "at that time had just appeared on the market. The gear withstanded the extreme temperature drops with the lowest of -35°C at night." It's full of beauty, surfing, night shots and we think you'll love it! I Am Nature, is "a way of creating a Real Estate Film with conection-to-nature values" says Marco G.Lerin. It showcases the tranquil and nature surrounded Las Casas in Costa Rica. Wouldn't it be remarkable to stay there? Wow. CLICK HERE to vote for your favorite video. Voting runs through Sunday, April 14th at 11:59pm CDT. The winning video will be announced on Tuesday, April 16th on AirVuz.com See all five Drone Video of the Week Ep 7 nominees HERE!